Preet Kaur is B.tech (Electronics & communication Engg.) from DCRUST, Murthal and M.tech (RF& Microwave Engg.) from IIT Roorkee and currently pursuing her Ph.D from YMCA University of Science and Technology, Faridabad. Her academic interests include metamaterials, antenna design and electromagnetic wave theory. She is working as Assistant professor (Electronics Engg.) with YMCA University, Faridabad since 2008. Dr.S.K.Aggarwal is B.tech (Electrical Engg.) from NIT, Calicut (Kerala) and M.tech from Delhi College of Engineering and Ph.D from Jamia Milla Islamiya University, Delhi. He is currently the Professor and Chairman of electronics department with YMCA University of Science and Technology. 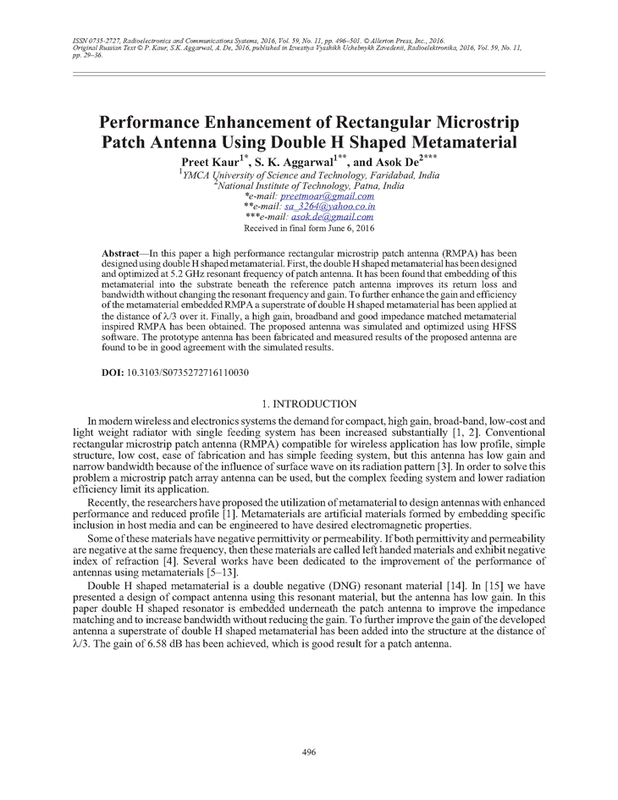 In this paper a high performance rectangular microstrip patch antenna (RMPA) has been designed using double H shaped metamaterial. First, the double H shaped metamaterial has been designed and optimized at 5.2 GHz resonant frequency of patch antenna. It has been found that embedding of this metamaterial into the substrate beneath the reference patch antenna improves its return loss and bandwidth without changing the resonant frequency and gain. To further enhance the gain and efficiency of the metamaterial embedded RMPA a superstrate of double H shaped metamaterial has been applied at the distance of λ/3 over it. Finally, a high gain, broadband and good impedance matched metamaterial inspired RMPA has been obtained. The proposed antenna was simulated and optimized using HFSS software. The prototype antenna has been fabricated and measured results of the proposed antenna are found to be in good agreement with the simulated results. XU, HUILIANG; ZHAO, ZEYU; LV, YUEGUANG; DU, CHUNLEI; LUO, XIANGANG. Metamaterial superstrate and electromagnetic band-gap substrate for high directive antenna. Int. J. Infrared Millimeter Waves, 2008, v.29, n.5, p.493-498, DOI: http://dx.doi.org/10.1007/s10762-008-9344-y. CHAURAYA, A.; KELLY, J.; PALIKARAS, G.K.; MULENGA, C.B. ; FLINT, J.A. ; FERESIDIS, A.P. ; VARDAXOGLOU, J.C. Planar and cylindrical metamaterial structures for antenna applications. EMTS Int. URSI Commision B-Electromagnetic Theory Symp., July 2007. LIANG, JING; YANG, HUNG-YU DAVID. Radiation characteristics of a microstrip patch over an electromagnetic bandgap surface. IEEE Trans. Antenna Propag., Jun. 2007, v.55, n.6, p.1691-1697, DOI: http://dx.doi.org/10.1109/TAP.2007.898633. KOCK, W.P. Metal-lens antennas. Proc. IRE, Nov. 1946, v.34, n.11, p.828-836, DOI: http://dx.doi.org/10.1109/JRPROC.1946.232264. WU, B.-I. ; WANG, W.; PACHECO, J.; CHEN, X.; GRZEGORCZYK, T.M. ; KONG, J.A. A study of using metamaterials as antenna substrate to enhance gain. PIER, 2005, v.51, p.295-328, DOI: http://dx.doi.org/10.2528/PIER04070701. MA, Y.G. ; WANG, P.; CHEN, X.; ONG, C.K. Near-field plane-wave-like beam emitting antenna fabricated by anisotropic metamaterial. Appl. Phys. Lett., 2009, v.94, p.044107, DOI: http://dx.doi.org/10.1063/1.3077128. GARG, BIMAL; AGRAWAL, NITIN; SHARMA, VIJAY; TOMAR, ANKITA; DUBEY, PRASHANT. Rectangular microstrip patch antenna with “pentagonal rings” shaped metamaterial cover. Proc. of Int. Conf. on Communication Systems and Network Technologies, CSNT, 11-13 May 2012, Rajkot. IEEE, 2012, p.40-44, DOI: http://dx.doi.org/10.1109/CSNT.2012.18. PANDEESWARI, R.; RAGHAVAN, S.; BAGDE, PRAVIN A.; CHITTIPOTHUL, ANANDA KUMAR. A compact multi-split ring resonator loaded antenna. Proc. of Int. Conf. on Communications and Signal Processing, ICCSP, 3-5 Apr. 2013, Melmaruvathur. IEEE, 2013, p.807-810, DOI: http://dx.doi.org/10.1109/iccsp.2013.6577168. HA, JAEGEUN; KWON, KYEOL; LEE, YOUNGKI; CHOI, JAEHOON. Hybrid mode wideband patch antenna loaded with a planar metamaterial unit cell. IEEE Trans. Antennas Propag., Feb. 2012, v.60, n.2, p.1143-1147, DOI: http://dx.doi.org/10.1109/TAP.2011.2173114. CAO, WENQUAN; XIANG, YANG; ZHANG, BANGNING; LIU, AIJUN; YU, TONGBIN; GUO, DAOSHENG. A low-cost compact patch antenna with beam steering based on CSRR-loaded ground. IEEE Antennas Wireless Propag. Lett., 2011, v.10, p.1520-1523, DOI: http://dx.doi.org/10.1109/LAWP.2011.2181316. ATTIA, H.; SIDDIQUI, O.; RAMAHI, O.M. Artificial magneto-superstrates for gain and efficiency improvement of microstrip antenna arrays. Progress in Electromagnetics Research Symp., 5-8 Jul. 2010, Cambridge, USA. 2010, p.878–881. PALANDOKEN, MERIH; GREDE, ANDRE; HENKE, HEINO. 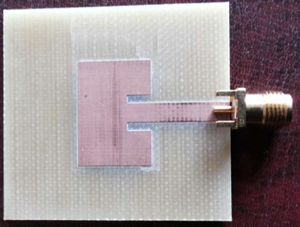 Broadband microstrip antenna with left-handed metamaterials. IEEE Trans. Antennas Propag., Feb. 2009, v.57, n.2, p.331-338, DOI: http://dx.doi.org/10.1109/TAP.2008.2011230. KAUR, PREET; AGGARWAL, S.K. ; DE, ASOK. Design of compact rectangular patch antenna using square grid and I shaped metamaterial. Proc. of Int. Conf. on Signal Processing and Communication, ICSC, 16-18 Mar. 2015, Noida. IEEE, 2015, p.132-135, DOI: http://dx.doi.org/10.1109/ICSPCom.2015.7150634. BLAHA, MICHAL; MACHAC, JAN. Planar resonators for metamaterials. Radioengineering, Sept. 2012, v.21, n.3, p.852-859, http://www.radioeng.cz/fulltexts/2012/12_03_0852_0859.pdf. KAUR, PREET; AGGARWAL, S.K. ; DE, ASOK. Double H shaped metamaterial embedded compact RMPA. Proc. of Int. Conf. on Advances in Computing, Communications and Informatics, ICACCI, 24-27 Sept. 2014, New Delhi. IEEE, 2014, p.483-486, DOI: http://dx.doi.org/10.1109/ICACCI.2014.6968492. POZAR, DAVID M.; SCHAUBERT, DANIEL H. Microstrip Antennas: The Analysis and Design of Microstrip Antennas and Arrays. NewYork: IEEE Press, 1995, DOI: http://dx.doi.org/10.1109/9780470545270. NICOLSON, A.M.; ROSS, G.F. Measurement of the intrinsic properties of materials by time-domain techniques. IEEE Trans. Instrum., Meas., Nov. 1970, v.19, n.4, p.377-382, DOI: http://dx.doi.org/10.1109/tim.1970.4313932. WEIR, W.B. Automatic measurement of complex dielectric constant and permeability at microwave frequencies. Proc. IEEE, Jan. 1974, v.62, n.1, p.33-36, DOI: http://dx.doi.org/10.1109/PROC.1974.9382. ZIOLKOWSKI, R.W. Design fabrication, and testing of double negative metamaterials. IEEE Trans. Antennas Propag., Jul. 2003, v.51, n.7, p.1516-1529, DOI: http://dx.doi.org/10.1109/TAP.2003.813622.